“Today the world is looking at Costa Rica, and Costa Rica, once again, sends forth a beautiful democratic message. 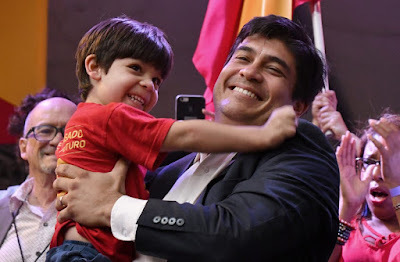 Well done, Costa Rica,” said Carlos Alvarado, the victor in today’s presidential runoff with a surprisingly decisive 60.8 percent of the vote at press time, with 39.2 percent for his rival, conservative pastor Fabricio Alvarado. The president-elect delivered his speech to a euphoric crowd at the Plaza Roosevelt in San Pedro, the university district just east of downtown San José. 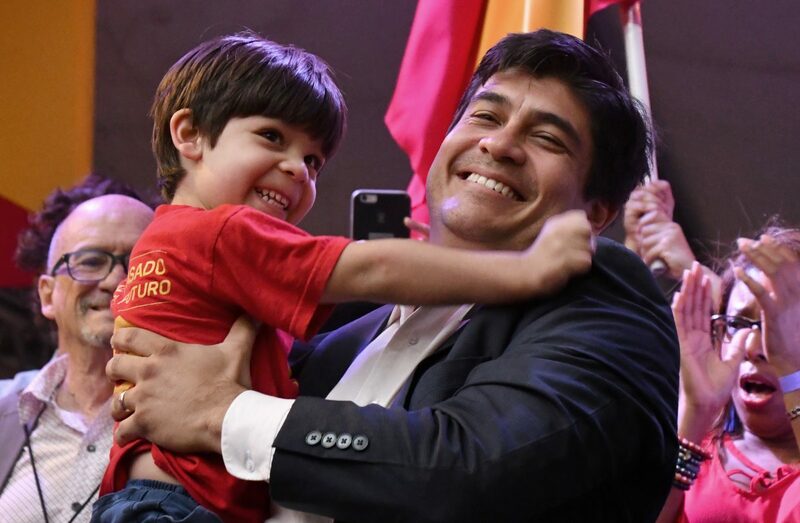 He thanked his opponent for his hard-fought campaign, which divided Costa Ricans in unprecedented ways over issues including marriage equality. He also thanked Fabricio Alvarado for his pledge of support for the new government. To deafening applause, the president-elect thanked Rodolfo Piza, the former candidate for the Social Christian Unity Party (PUSC) whose declaration of support for Carlos Alvarado early in the second round was undoubtedly a decisive factor in his victory. “The flag we must raise tonight with great pride to show to the world is the flag of Costa Rica… a unique country that we love, and for which we work… What unites us is much greater than what divides us,” he said.